IT IS HELPFUL TO REMEMBER THAT THE COURSE DEFINES "FORGIVE" DIFFERENTLY THAN MOST OF US HAVE LEARNED IN THIS WORLD. IN THE COURSE, FORGIVENESS MEANS LETTING GO OF ILLUSIONS, OR LETTING GO OF THE PAST. "This is a course in mind training." Absence From Felicity, Kenneth Wapnick, Ph.D.
"Living A Course in Miracles: An Essential Guide to the Classic Text", Jon Mundy, PhD--"Living A Course in Miracles" is a wonderful guide to both understanding and behavior, with light in our minds and love in our hearts.--Marianne Williamson, author of "A Return to Love"
According to Amazon.com after different editions of the Course itself and Marianne Williamson’s "Return to Love" it is the best-selling book based on the teachings of A Course in Miracles. and now I know the Course I take! It's there at your command. Miracles,on the other hand, induce action. or anything else you'd like to share. 2. When asked to 'Select Profile', the easiest thing to do is choose 'Anonymous'. 3.Then you can add your name after your comment if you want to do so. And I am His child that's true. And to let them show me how. Because It knows where I have been. You'll be labeled successful one day. The energy beneath our skin. Who never left us hollow. -Ruthann Herring 1984 from her book ,"A View From The Heart"
Do We Have a Body? Are We a Body? Yes and no. We have a body, but we are not a body. We have a body to be used as an instrument. It is a tool to be used for communication; teaching and learning. However that is not what we really are. In reality, we are Spirit. We are Mind; part of the one Mind of God. So let us not be confused or conflicted by this paradox. It would indeed be foolish to attempt to convince ourselves that we do not have a body. Of course we do. And the Course acknowledges this as so. Would God deny us the appreciation of experiencing the sights of the wonders of nature, for example? Would He have us believe we cannot enjoy the sound of beautiful music? We are all of one Mind; God Mind. There is no separation. In this sense we are obviously not bodies. We are the extension of the One Source. Everything exists as one undivided thought. There is no place for bodies on this level. This is the level of pure Spirit. Your body is not who you are. Your mind is who you are. So, you are not a body. You are a mind; a part of the Mind of God. Do not think your mind is in your brain and your brain is in your body. Your Mind is spirit and One with God. You have the use of a vehicle, here on earth, which is a body. The bodies we have are separate. The Mind that we are is One. A Course in Miracles, written by Dr. Helen Schuchman and Dr. William Thetford, describes a purely non-dualistic approach to spirituality. Schucman scribed the book based on an inner voice, which she described as coming from a divine source, specifically Jesus Christ. The book uses traditional Judeo-Christian terminology, but is not aligned to the doctrines of any religions or denominaitons. Since it first became available for sale in 1976, over 1.5 million copies have been sold worldwide in nineteen different languages. 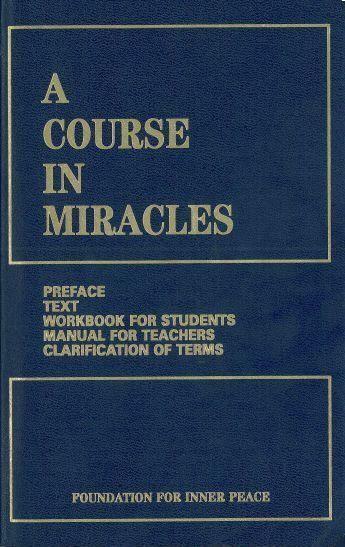 A Course in Miracles integrates ideas from Christianity, Eastern religions, mysticism, psychology and Platonism, viewing reality as monistically consisting of a single thing, the love of God, and the physical world as a projection of the mind. A Course in Miracles focuses on forgiveness and removing the blocks to the awareness of loves presence. "When I was introduced to 'A Course in Miracles', it's impact made all else secondary forever." This is the website of Forgiveness University.